TIFF is a popular image format for those who want to retain the quality of the image just in case they want to edit the image. But converting PDF to TIFF can be a difficult process especially if you have a lot of PDF pages to convert. To batch convert PDF to TIFF, you need a program that is not only reliable but one that will ensure the quality of the original PDF document retains its original formatting. Batch PDF to TIFF conversion is a delicate process that requires a lot of care. It therefore helps to have the best program to convert multiple PDF to TIFF. 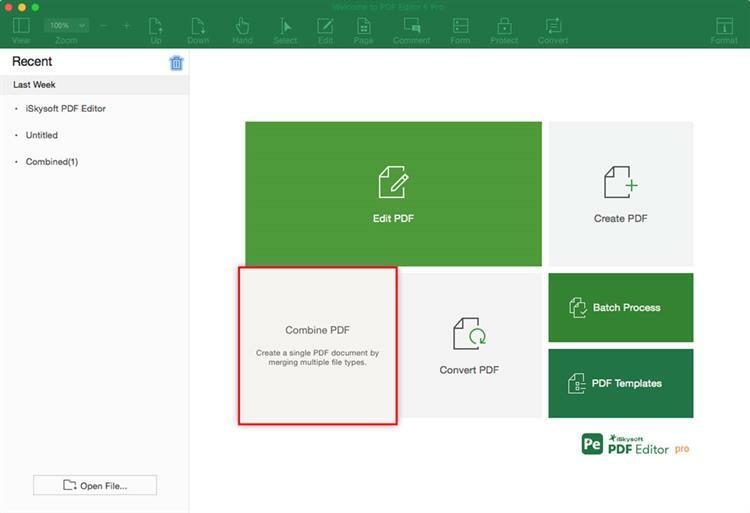 Lucky for you, this article will provide you with the best tool to convert multipage PDF to TIFF and show you how to use it. 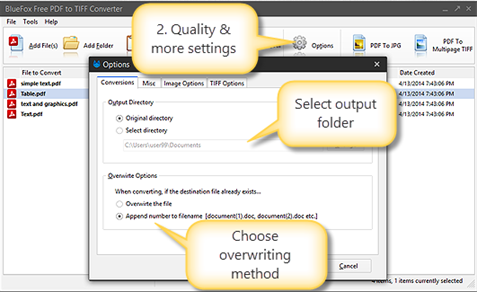 For a PDF to TIFF converter to be classified as the best, it needs to not just have the best conversion processes that make it easy to batch convert PDF to TIFF but also have the right tools to help you manage any PDF document. The program that embodies all of the features is iSkysoft PDF Editor 6 Professional for Mac (or iSkysoft PDF Editor 6 Professional for Windows). It is a PDF management tool that can be useful for conversion and editing of any PDF document. 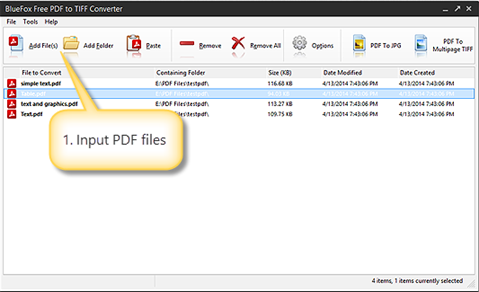 This professional PDF editor provides you 2 easy ways to convert multiple PDF files to TIFF. You can install the program on your computer and then follow these simple steps depending on the method you want to use. With the program installed on your computer, double-click on its icon to launch the program. In the main window, click on "Batch Process" and select "Convert." Click on "Add Files" to import multiple PDF documents into the program. 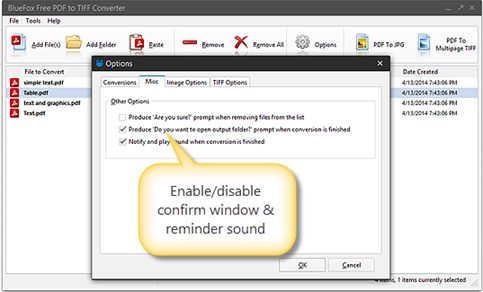 To convert the added files, select "TIFF" as the output format and then click "Convert". 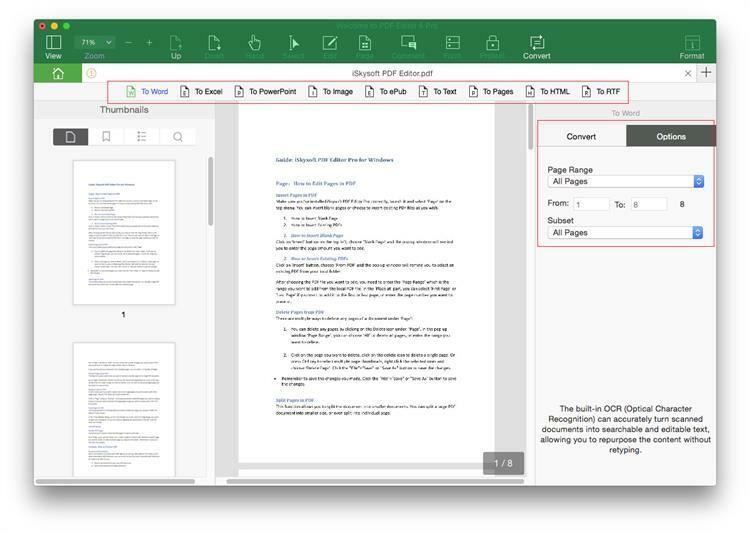 In the main window, click on the "Combine" Tab and in the window that opens, click on "Add Files" to begin adding the PDFs you want to combine into the program. Once all the PDFs have been combined, click on "Convert" in the top window and then select "To Image" and from the options, select "TIFF" as the output image. 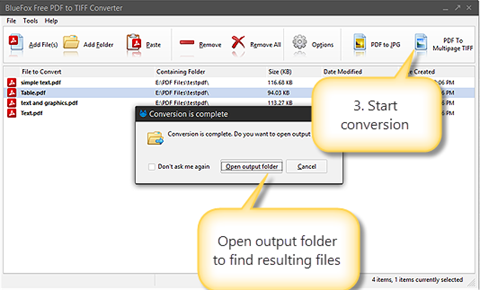 iSkysoft PDF Editor 6 Professional for Mac (or iSkysoft PDF Editor 6 Professional for Windows) is one of the best PDF to TIFF batch converter that you can use to convert PDF files from one format to another. But like we said, for a tool to be deemed the best, it has to have certain characteristics that provide the best balance between ease of use and efficiency. To do that correctly, the program has to have the best balance of features on any program. The following are just some of the features iSkysoft PDF Editor Pro has to offer. Creating a PDF document using this program is very easy; all you have to do is open any file within the program. Aside from converting PDF to TIFF, you can also convert PDF files to a wide range of other formats including Word, Excel, PowerPoint, JPEG, PNG and more. It also has editing features that make it capable to edit both images and text on any PDF file. It also annotation features that can be used to add notes, comments and even custom stamps to a PDF document. Its OCR function is useful for editing scanned or image-rich PDF documents. It also comes with powerful document protection features that you can use to keep your PDF way from unauthorized individuals. You can add a password, redact some of the text or even add a signature to the document. You can also easily share the PDF document via email, Dropbox or Google Drive from within the program. When you need a free PDF to TIFF converter the most reliable tool to use is BlueFox Free PDF to TIFF converter. This tool is completely free, as the name suggests, and can be very handy when you need to convert PDFs to TIFF regardless of the number of PDF documents you have to convert. You will obviously have to use different modes to convert a single or multiple PDFs to TIFF but it is highly reliable and even easy to use. One of the main advantages of using this free tool to convert PDF to TIFF is you can customize the output as much as possible. This means that you can set the output parameters like monochrome, truecolor and grayscale to get the TIFF image just as you want it. It also doesn’t hurt that the output TIFF will retain all of the original formatting. Step 1. Begin by installing BlueFox Free PDF to TIFF converter to your computer. Once the program is installed, launch it to begin conversion. Step 2. The next step is to add files to the program. To do that, click on "Add Files" in the main window. You can also choose to "Add Folder" if the PDF documents you want to convert are organized in a single folder. As you add them, they will be listed in the window in ascending order. You can remove any that you don’t want converted by clicking "Remove". Step 3. To specify the conversion settings, click on "Options". In the popup window that appears, ensure that the "Conversions" tab is open. Here you can specify the output folder of the converted files. To keep them in the original folder, ensure "Original Directory" is selected. To change the folder, click on "Change" to choose the directory you want. Step 4. Now click on the "Miscellaneous" tab. Here, you have the option to choose a number of options. 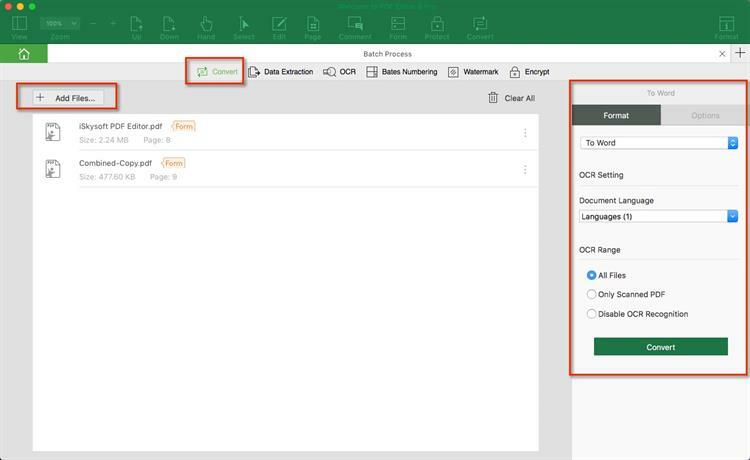 You can choose whether you want to open the conversion folder when the process is compete and also choose whether or not you want to be notified when the conversion process is complete. Step 5. Now, in the same popup window, click on the "TIFF Options" tab so you can specifically set the parameters for the expected TIFF files. 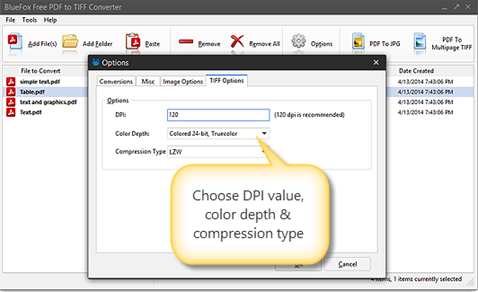 Here, you can set the DPI value, the compression type and the compression depth. Click "OK" when you are ready. Step 6. To begin the actual conversion process, click on "PDF to Multipage TIFF". Wait a few seconds for the conversion process to be completed. Depending on the settings you chose, the output folder may open automatically once the process is complete. If not, click on "Open Output Folder" to check that all files have been converted. To begin the actual conversion process, click on "PDF to Multipage TIFF". Wait a few seconds for the conversion process to be completed. Depending on the settings you chose, the output folder may open automatically once the process is complete. If not, click on "Open Output Folder" to check that all files have been converted.